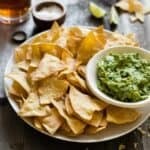 This recipe yields about 4 to 6 cups of chips. Do note that the chips cook faster if you use a dark baking sheet or if you are baking them in a well-heated oven. Check the chips at around 8 or 9 minutes to see if they’re done. Also, give the chips 5 to 10 minutes to cool before you start eating them. The chips will continue to crisp up as they cool. Preheat oven to 375ºF (190ºC). Brush two large baking sheets with olive oil or use cooking spray. In a small bowl, mix 2 tablespoons of oil and 1 tablespoon of lime juice together. Brush oil on one tortilla, making sure to cover the entire surface. Stack another tortilla on top and brush on oil mixture. Continue until you get have about 7 or 8 tortillas in a stack. Cut tortillas in half. Cut each half into small triangles. Set aside. Brush oil on remaining tortillas and cut into triangles. Arrange tortilla pieces on baking sheet in a single layer. They can be lined right next to each other as they’ll shrink once baked. Sprinkle salt all over tortilla pieces. Bake for 8 to 12 minutes, or until the chips are golden. Depending on the size of your baking sheets, you may need to bake everything in two batches. Let chips cool before serving. Store chips in an airtight container. They should stay crispy for 1 to 2 weeks.